The Event Lady is Now Retired, but can Refer other Service Providers! Isabel Albuerne "The Event Lady" is now retired, but can refer other officiant - wedding notary service providers in South Florida and SW Florida, as well as bilingual referrals for civil officiant services in the Sunshine State. She presently limits her services to writing of wedding ceremonies and vows. As of 2012, she offers custom, personalized wedding ceremony writing services to her bridal readers available for purchase by inquiry. At the present, she publishes this Internet Blog and On-Line Resource guide. Albuerne was the past editor of a print magazine publication, which you can still view digitally on this site's magazine page. The past print issues are available for download totally free of charge. They give wonderful ideas and resources to plan your SW Florida event. She presently uses this site to publish an on-line Florida planning guide for bridal events and quinceañera parties in the area. This event planner has over 30 years of experience as an event consultant, day of coordinator for coming of age traditional sweet sixteen and quince celebrations. These years of hands-on expertise are the perfect school, which enable her to also offer consulting services by the hour. Please Inquire. 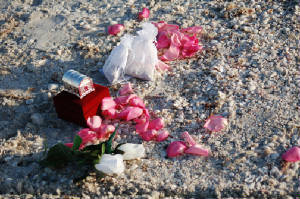 Get married on a Florida beach or at any location of your choice. We can suggest locations with a consulting interview. 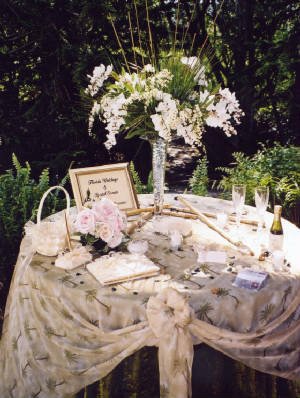 We offer meaningful and romantic personalized non-denominational wedding ceremonies writing, just for you! Please Note: This service does not include any decorations, location rental fees, or permits if needed. This service does not include any decorations, location rental fees, or permits if needed. You must procure a Florida State Marriage License for an additional $93.50 at any Clerk of the County Court in Florida; some links are listed at the bottom of this page for your convenience. Miami, West Palm Beach, Ft. Lauderdale, Naples, Marco Island, Sanibel, Captiva, Upper North Captiva Island, Ussepa Island, Bonita Springs, Bonita Beach, Ft. Myers Beach, Estero, Cape Coral, Belle Glade, Lehigh, Immokalee, Tampa, Charlotte, Punta Gorda, Bradenton, Lakeland, and Orlando! of your very special wedding or quince day.